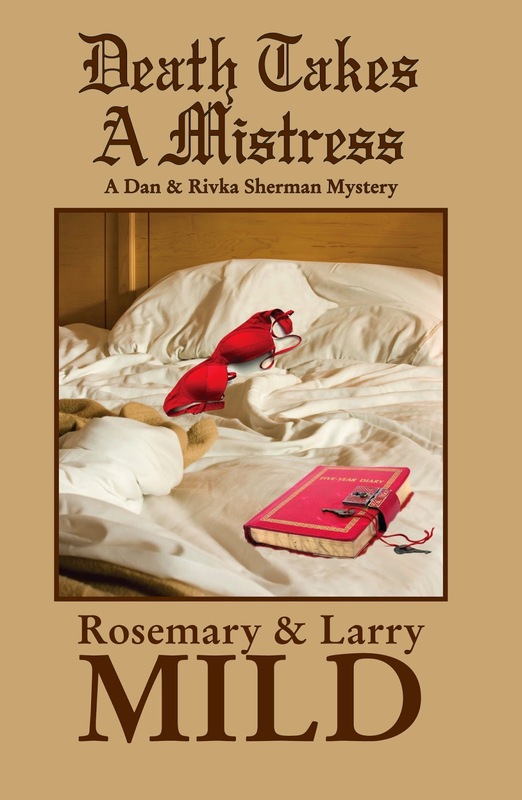 Death Takes a Mistress is a cozy mystery by Rosemary and Larry Mild. It is the second book in the Dan and Rivka Sherman mystery series. The book begins in London in 1982, where a loving single mother is murdered by her lover. We see the baby safely placed with family friends, and then the book flashes forward to Annapolis, Maryland, in 2005. The baby has now grown up into a bright, resourceful young woman named Ivy Cohen. Ivy has learned that her birth father - who killed her mother - is from Annapolis, and she has travelled to Annapolis to find him. Ivy has the good fortune to connect with Dan and Rivka Sherman, a delightful couple who own a local bookstore. Ivy finds employment and friendship with them, and they help in her search. Dan is able to help Ivy find her mother's old diary through a contact at Scotland Yard. Ivy then learns more about her mother and her father as well. She knows that her father is one of four Jewish businessmen from Annapolis. The story takes many twists and turns as Ivy and the Shermans investigate the case. I am an avid mystery reader, but I was kept guessing up until the end of the book. The book is written in short chapters that focus on different characters. There is a very large cast of characters in this book, and I would have found a listing of characters and/or a family tree (not including Ivy's parentage!) to be very helpful. I have not read the first Dan and Rivka Sherman mystery, but this book worked very well as a stand-alone mystery. Ivy is a warm and sympathetic character, and the Shermans - and their bookstore - were wonderful. I enjoyed the details about the bookstore and the Dan and Rivka's weekly religious traditions. I would recommend this book for fans of cozy mysteries. I received a copy of this book from Maryglenn McCombs Book Publicity in exchange for an honest review.